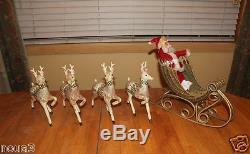 Here is an original Vintage Christmas Santa Claus and Reindeer Sleigh set that dates from the 1950's? 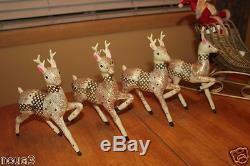 The Santa figure and the Reindeer are made of celluloid that is lightweight and hollow. The Sleigh is made of wood. 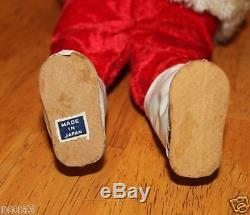 Santa can be removed from his sleigh and he is wearing his brightly colored Red Christmas Outfit with boots and belt. 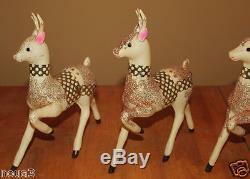 The Reindeer are Gorgeous and covered with Glitter that sparkle very nicely in light. And their little faces are amazingly adorable. 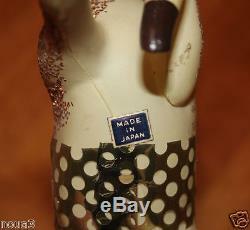 Santa and one Reindeer are Marked on the bottom "Japan" on the original blue paper label. The reindeer stand about 9 inches tall and their bodies are about 5 inches in length. The Sleigh measures just under 9 inches tall and about 16 inches in length. The overall length of this set can vary depending on the seperation of the individual figures. If you look at the first picture the full length measures about 33 inches. Overall this is a wonderful set that is in good condition. I pictured the only found issues - Please review the last two pictures. 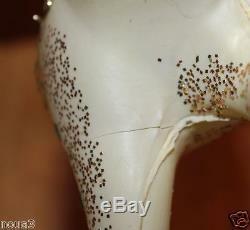 The hind leg on two different Reindeer have a hairline crack in the celluloid. My husband has carefully applied colorless Glue on both legs for reinforcement. This is a Rare and Beautiful Christmas Decoration. I have never seen anything like it before. The size alone sets it apart from anything else I have seen. The item "Vintage 1950's Celluloid SANTA CLAUS REINDEER SLEIGH CHRISTMAS FIGURINE JAPAN" is in sale since Thursday, January 21, 2016. This item is in the category "Collectibles\Holiday & Seasonal\Christmas\ Modern (1946-90)\Figures\Sleighs". 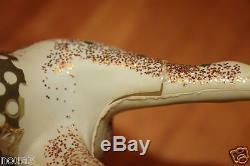 The seller is "noua3" and is located in Santa Clarita, California. This item can be shipped to United States.